Wise County native Katherine O'Neill Peters Sturgill (March 3, 1907–June 19, 1975) began playing the parlor organ and singing Irish tunes for her father as a child. Known as Kate, she had a lifelong interest in mountain tunes. After her marriage to Sidney Peters, she formed the Lonesome Pine Trailers in 1927. The band performed a mixture of sacred songs, folk tunes, and instrumental dance tunes. She later began writing original compositions. During the Great Depression, Peters put her skills to work through the Works Progress Administration, which funded the construction of a cabin near the town of Norton to serve as a community recreational facility. There, she and her sister taught handcrafts, music, and dance, and put on plays. The sisters also provided lunch for undernourished students at the nearby school. During this time she met a WPA folk song collector who recorded her in 1939. She also collected folk songs, sometimes assisting her mother's relation A.P. Carter, of the legendary Carter Family musical group. As part of the Cumberland Valley Girls in the 1940s, Peters performed on the WNVA radio station in Norton and recorded with Folk-Star Records in Tennessee. 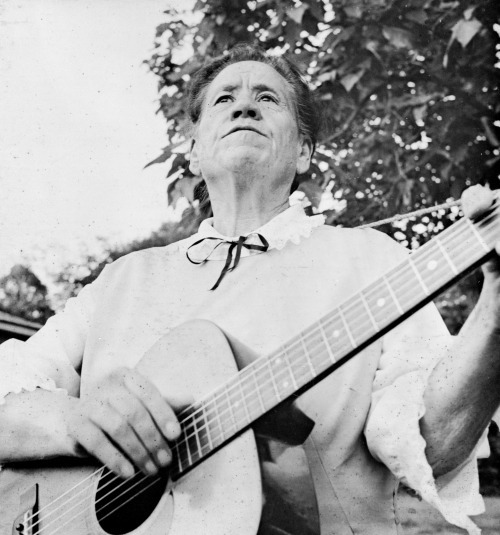 In her later years, after her first husband died and she married former coal miner Archie Sturgill, she became well known as a local funeral singer. Kate Sturgill's rich legacy lives on through her recordings at the Library of Congress's American Folklife Center, as well as the Country Cabin II, a venue on the Crooked Road music trail that traces its ancestry to the WPA cabin, and the annual Dock Boggs and Kate Peters Sturgill Festival. Image Courtesy of Blue Ridge Institute and Museum. “Kate Peters Sturgill,” Virginia Changemakers, accessed April 21, 2019, http://edu.lva.virginia.gov/changemakers/items/show/353.